You might think that the sole reason for hiring a financial adviser is to help you manage your money and finances better. An office-bound, number crunching, spreadsheet warrior, so to speak. That is, of course, one part of what I do. But overlooked and often misunderstood is the unique opportunity I get to help our clients identify and plan for the ambitions in life that mean most to them. I frequently hear colourful personal life stories and the untold goals of new and existing clients. And for those who are open with me, I get to be a sounding board and part of a support framework which works towards achieving those goals. 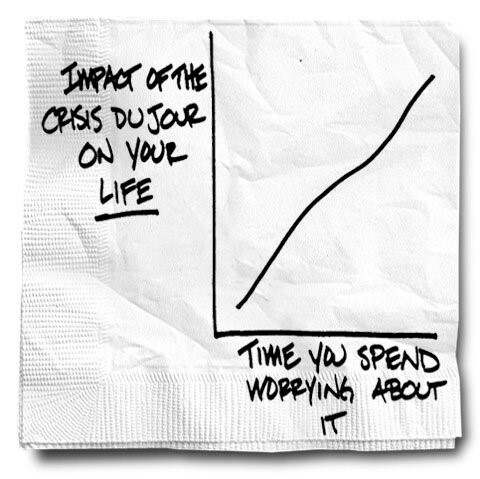 At the same time, I steer clients clear of the worry and misinformation that can easily derail a well laid out plan. So, it’s not just about money. It’s about people and their aspirations in life. Because without a goal and a plan, the accumulation of money is meaningless. “It’s not just about money. It’s about people and their aspirations in life. Because without a goal and a plan, the accumulation of money is meaningless”. In some cases, goals might be as simple as being able to retire with ‘enough’. But for others, it’s more refined, with specific bucket lists and making changes to improve the quality of life. And whether I’m talking to creative folk, business owners, retirees or those from traditional professions, everyone has hopes and dreams, which generally require planning to make them happen. Some happy moments I’ve experienced with clients this year include the successful adoption of children and the realisation by another family that they are financially secure enough to pursue their alternative career ambitions and leave the rat race. It’s a great honour to be privy to conversations like these, especially when they are ambitions that have not been shared publicly. But it’s not all good news though, and I have again witnessed the aftermath of ill health, death and divorce this year. Always a shock, I wouldn’t want to walk in the shoes of any of the clients adjusting to this change. 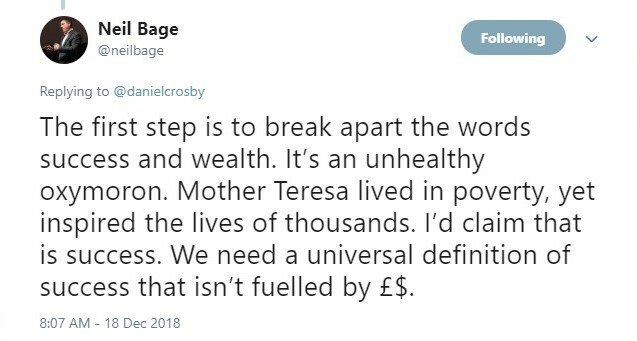 It certainly puts it all in perspective and having experienced many cases like these down the years, my own attitude to the definition of success and wealth, is not monetary. Family, health and a balanced lifestyle come first for me. I’m not immune to wanting nice things, but I’ve long given up comparing myself to other people materially. I don’t drive a high-end car and I live in a relatively affordable part of London because I am not willing to handicap my lifestyle so that I can project perceived ‘wealth’ to people who really don’t matter. Success isn’t measured by what you see or by how much money you have and my friend Neil Bage, a Behavioural Specialist, reminded me of this in one of his replies on Twitter. It’s so easy to be influenced by what is around us. Non-stop coverage of an uncertain financial backdrop, Brexit fears and the customary end of year (almost certainly wrong) investment market predictions for 2019 don’t help either. So, I remain open-minded about outcomes and will switch off from the news cycle completely over Christmas. I don’t see how worrying about topics I have absolutely no control over will help. So, on that note, I wish all our clients and readers a worry-free Christmas and a Happy New Year. I’ll sign off with a rather apt video and the classic words of Bobby McFerrin. 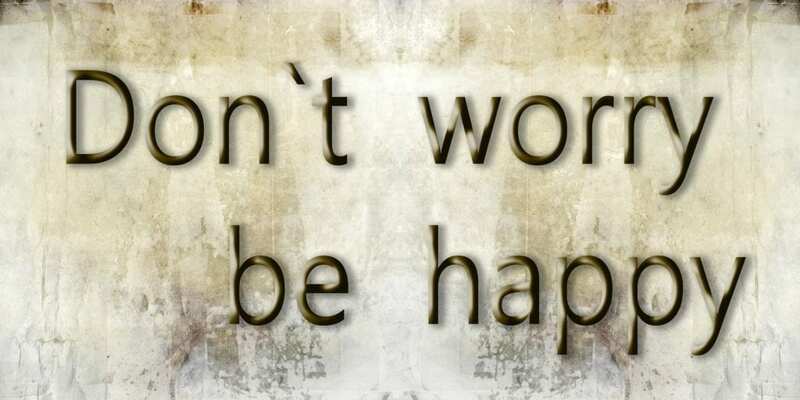 Don’t Worry Be Happy. See you again in 2019!